I came up with this drill after a past player of mine (and their family) continued to question why she was not serving in a game when she was CLEARLY a very good server. Serving the ball over is great, but if you can’t play defense, we’re giving up an opportunity to earn more points for our team, and that’s not fair to everyone else. Aside from proving a point, this drill is also great because it puts PRESSURE on your team. That’s hard to do in practice, but as I said in my Team Serving Challenge drill, you need to practice under pressure to fully prepare for a game. OK, are you ready to get into the drill? For this drill, you will need a large chalkboard or whiteboard, different colored markers (2-3 would be ideal), and something that lets you show the whiteboard to your team as they’re passing (if you don’t have your whiteboard on a roller or on the wall, you can do what I did. Just prop it up against a chair). You’ll need to write down the names of each player on your team, and make a grid below with blank squares. Your goal number of passes will determine the number of squares you have under each name. (Tip: Write the players in alphabetical order and have them get into groups based on that order. This way you will not be searching for names once the drill actually starts). You’ll also split your team into two groups, one group shagging and being target, and one group passing. You’ll also need an assistant for this drill. You could make it work without one, but it’ll be much better WITH an assistant. The shagging team will spread out around the court and the target will stand in the IDEAL passing zone to show where we want the ball set (between zones 3 and 4, a step or two away from the net). Passers will line up on the opposite side from the coach/assistant (who will be hitting downballs). Depending on the age level, you can either move them side to side, short to deep, deep to short, or if they are newer/younger players, they can just stand in their defensive position for a downball in the backrow. Set requirements for the drill: either perfect passes ONLY (no more than one step away for the target, often called a “3” or a “3-option” pass) or passes that would still result in a good set (up to 2 steps away from target, a “2” or “2-option” pass). The pass MUST be higher than the height of the net in order to count, antennae height is ideal for most ages. Initiate the drill with a downball from the coach to your passing line. As the players go through (5x each, for example), they will pass and then return to the end of their line, making this rather quick. You will put X’s in the boxes as players make good passes to the setter. 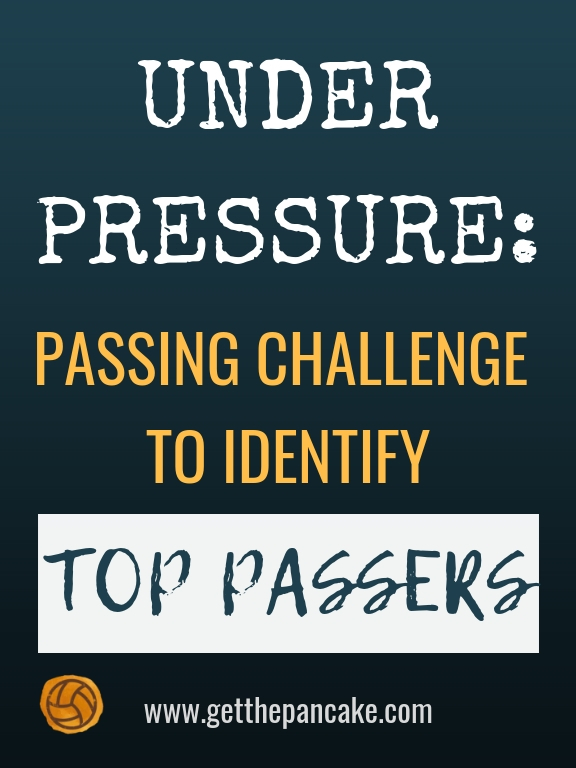 If a player’s pass is outside of your requirement (2- or 3-option pass), do not write anything. Once each player has had 5 attempts, switch groups. You’re going to want to do this in multiple positions, say left back, middle back, right back. This will give you a good idea of everyone’s passing skill overall, and won’t lean towards benefiting certain players who are passing in their position. I like to switch marker colors as the players move through different positions/rounds (label which color means what). This helps ME understand who’s passing well from where. And it also shows who consistently passes well across all positions. Run this drill until someone (hopefully multiple players) reach your goal number. Give each group a chance to reach it. The winner(s) get a benefit (I like to do things like “doesn’t have to shag for the rest of practice”). TAKE A PICTURE OF YOUR WHITEBOARD. This will serve as a good reference later. This drill allows you to simulate game-like pressure for your players. With their performance so obvious to everyone on the team, they are not able to hide poor performance as easily as they can in most practice drills. I used this drill to demonstrate playing time decisions, and had a chat with the player after the drill. You obviously don’t have to use this drill in such a way, but I think it’s nice to have in your back pocket if needed. You could also use this drill as part of a fun competition day at practice. You could also run competitions with serving, setting, hitting, and even blocking. Keep track of winners throughout practice and maybe the top point earner(s) get to be captain at your next tournament! As I said in the opening sentence… this drill could result in hurt feelings. Be ready for parent backlash if their daughter is the only one who passes two decent balls to target while everyone else passes 10. In the end though, not EVERYONE is a backrow player, and that’s ok! Even if this player only got two passes to target, she’s on your team for SOME reason, right? She’s probably better in another position, and that’s ok.
You’ll help build resilience in your players if they’re exposed to this type of challenge frequently. Contrary to popular belief, volleyball is NOT all sunshine and rainbows!